Australia pacer Mitchell Starc has been ruled out of the upcoming tour to India. Kane Richardson has been added to the squad as his replacement. Starc suffered a pectoral injury while bowling on day 5 of the Test against Sri Lanka in Canberra. The left-hander is an important prospect for Australia’s World Cup preparations. Now, he will target a return in the ODI series in UAE against Pakistan. 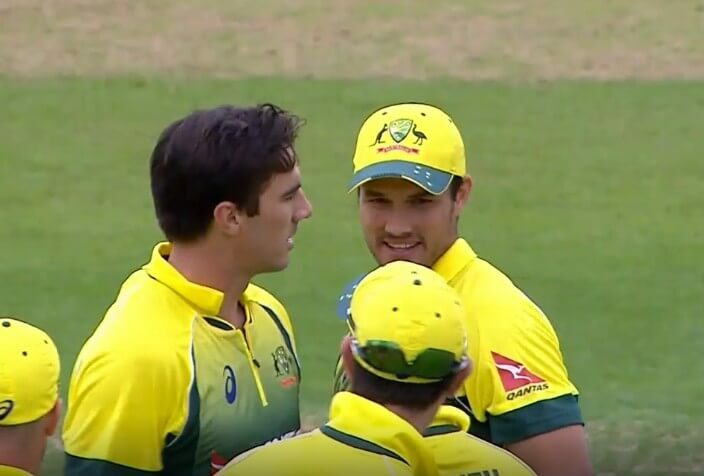 “Unfortunately, scans have revealed that Mitchell Starc sustained a substantial tear to his left pec muscle while bowling on the final day of the Test match in Canberra. This means he will be unavailable for the Tour of India, but we will instead target a return to play for the ODI Series against Pakistan in the UAE in March,” national selector Trevor Hohns said. Mitchell Marsh has been dropped from the side. Also, Peter Siddle and Billy Stanlake miss out. These 3 were a part of the squad when India toured Australia last month. “Peter Siddle and Mitch Marsh are unfortunate to miss out, but our message throughout the summer remains true, with such a big schedule ahead opportunities may well present themselves,” Hohns added. Right-arm fast bowler Kane Richardson finds a place in the squad once again. His recent form in the Big Bash League aided his selection. Additionally, D’Arcy Short will travel to India as a cover for Shaun Marsh who will join the squad after the birth of his second child. “Kane has been in outstanding form over the summer, including his recent performances in the BBL. Kane not only has experience playing ODI cricket for Australia, but he’s also performed well for his country when given the opportunity. Nathan Coulter-Nile provides us with another quality bowling option, he brings good energy in the field and can also score runs in high pressure situations. “Shaun Marsh will join the squad following the birth of his second child. Shaun is also working his way back from a hamstring strain, but we expect him to be available for the third ODI. D’Arcy Short has been named in the squad as cover for Shaun. D’Arcy has been in outstanding form in the BBL over the summer, and he gives us another strong batting option for the opening fixtures of the tour, which include two T20s,” added Hohns.